We are the one of the foremost manufacturers, exporters and suppliers of a superior quality Marble Diyas. Designed using premium quality raw material, the offered product is available in several designs, sizes and patterns in order to meet varied needs of clients. Offered diyas is renowned for their attributes like eye-catching patterns, beautiful designs, attractive look and fine finish. Clients can avail the offered product at market leading price. 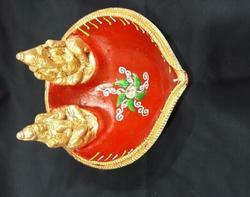 We are offering our clients with a wide range of Marble Diya. Designed and developed using excellent quality raw material under the guidance of skilled professionals, the offered product is highly demanded in the industry. Clients can avail the entire range of mirror rangoli from us in different designs, sizes and patterns as per their specific requirements. Clients can avail the offered product at reasonable price.